Having grown up in Texas, I’ve eaten at Luby’s Cafeteria more times than I can count. They’ve updated the menu to include healthier fare such as salads and grilled meat, but one thing that hasn’t changed much is their dessert section. Part of the fun of going through the line is and always has been getting to the end and seeing the mile high Luby’s chocolate cream pie, lemon meringue, layer cakes and fruit pies. Oh, and lots of colored gelatin, which for some reason, tastes better than other gelatin — so much so that sick friends have asked other friends to bring them gelatin from Luby’s. Weird, I know. I would have asked for pie! 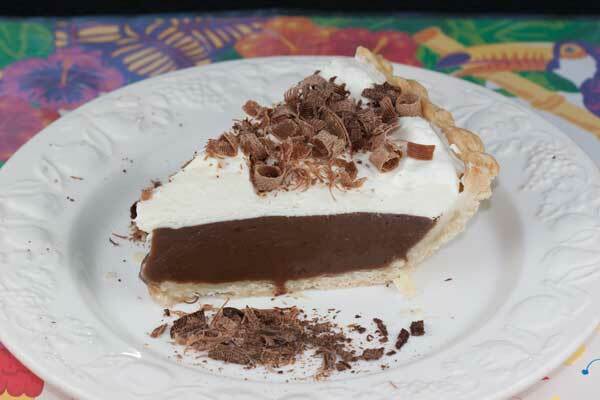 The recipe for Luby’s Chocolate Cream Pie, which Luby’s calls Chocolate Ice Box Pie, is from Texas Co-op Power, where it was published along with reviews for the cookbook Luby’s Recipe and Memories and the more history focused book, “House of Plenty: The Rise, Fall, and Revival of Luby’s Cafeterias (University of Texas Press, 2006)”. It tastes a lot like the chocolate pie my grandfather used to share when he ordered pie, in that it is sweeter and a little bit stiff thanks to the cup of marshmallows thrown in at the end. If you want a slightly creamier, looser pie, you could probably get away with leaving them out completely. However, they do add a nice structure. This pie would be good with either a pastry crust, chocolate crumb or graham crust. Although I’ve never been to Luby’s, Jeff has eaten there several times. He loves chocolate pie so I will be making this soon! This makes me so happy–largely because it reminds me of the chocolate cream pie my mom made when I was growing up. It wasn’t anything fancy but it was down-home tasty. Just looking at the pictures makes me happy. Looks scrumptious and beautifully plated!